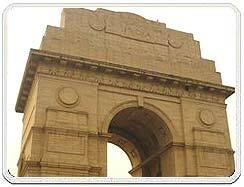 India Gate, primarily a memorial to the Unknown Soldier was Designed by Lutyens. 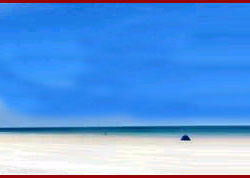 The 42 metre high structure is a war memorial in honour of the soldiers who died during the world war. The impressive structure from where stretch massive lush green lawns has an eternal flame (Amar Jawan Jyoti) to honour the memory of the unknown soldiers. India Gate prominently located in the vicinity of Rastrapati Bhavan is a major crowd puller during the hot summer evenings of Delhi by virtue of its lush green lawns. 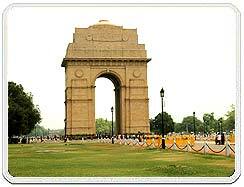 India Gate of Delhi is a 42 meter high gateway situated at Rajpath, New Delhi. Also famous as the 'All India War Memorial', the India Gate was designed by Sir Edwin Lutyens, who designed the New Delhi city. The base stone of India Gate of Delhi was laid by the Duke of Connaught. The structure of India Gate of Delhi was completed in February 1921. India Gate in Delhi at nearby is a famous recreation for the local people of Delhi in summer evenings and accepted picnic spot in winter months. 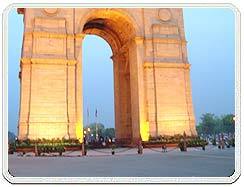 The trendy India Gate of Delhi is situated at the heart of the capital, and easily accessible by the tourists. India Gate of Delhi lies at the east end of Janpath that leads to the Rashtrapati Bhawan. India Gate of Delhi presents a variety of entertainment. The whole day can be spent by watching monkey presentation, riding a camel, viewing the soap bubbles that is blown all over the lawns of the India gate of Delhi, playing with balloons and more. In the evening, India Gate of Delhi is busy with evening walkers as well as tourists and movable vendors. You can feel the classic Indian fast foods, 'fruit chaat', 'bhelpuri', 'chana jor garam', 'dal ka pakodas', aerated drinks from the arcade of vendors stationed there. India Gate of Delhi is a majestic high arch, 42 meters high, built as a memorial to the Indian soldiers killed in the World War I. Under it burns an eternal flame. From the bottom of the arch one can get a good view of the Rashtrapati Bhawan of Delhi. India Gate, an "Arc-de-Triomphe" likes Archway in the middle of a crossroad. Almost similar to its French counterpart war memorial. It commemorates the 70,000 Indian soldiers who lost their lives fighting for the British Army during the World War and bears the names of more than 13,516 British and Indian soldiers killed in the Northwestern Frontier in the Afghan war of 1919. The foundation stone was laid by His Royal Highness, the Duke of Connaught in 1921 and was designed by Edwin Lutyens. The monument was dedicated to the nation 10 years later by the then Viceroy, Lord Irwin. Another memorial, Amar Jawan Jyoti was added much later, after India got its freedom. It is in the form of a flame that burns day and night under the arch to remind the nation of soldiers who laid down their lives in the Indo-Pakistan War of December 1971.